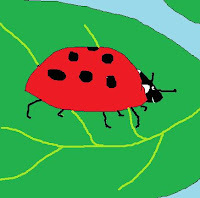 It's spring, and the weather's warming up a little bit in Seattle, reminding me of how I used to evict the ladybugs from the farmhouse at the end of each winter. It also brings to mind the story of the last great ladybug eviction. To tell this story, I first need to make a confession. My little farm on the Key Peninsula was really a plant nursery. I just call it a "farm" so people won't confuse it with a nursery for children, my being a woman and all. But, to clear up the record, the farm had greenhouses full of plants and fields full of rhododendrons and azaleas that were being grown for market, so it was in fact a nursery. Anyway, to control the aphid population and keep the rhodie leaves from getting all chewed up, the previous owner had imported boxes of ladybugs from California and released them on the property. Lady bugs love to eat aphids the way I love to eat chocolate. If you know anything about the winter weather here versus in California, though, you'll realize that in spite of plentiful aphids, those ladybugs were in no way happy about the change in their fortunes. Feeling sorry for the poor cold ladybugs, I'd allow them to over-winter in the farmhouse, as the previous owner had also done, judging by the fact that the house had never been caulked. When the weather cooled each fall, thousands would find their way in through the many cracks and crevices of the 100-year-old structure and nestle in the corners between the ceilings and walls. Because they slept through the long winter months, they were no bother at all. In fact, I could ignore the cobwebs guilt-free all winter. After all, I couldn't disturb our house guests, could I? 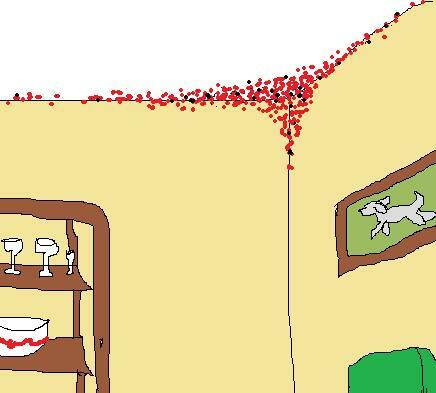 When the weather warmed up in spring, and the ladybugs began stirring in their corners, I'd open up all the windows and begin shooing them out. It might take me several sessions, but finally they'd all be outdoors again, happily eating aphids. The year Liz started high school, though, the ladybugs' fortunes took another turn for the worse. Brian had decided to switch things around and stay with me during the school week and his dad on the weekends, so now both kids had a 25-minute commute to school down a winding two-lane highway. With all their school activities requiring lots of back and forth trips, this just wouldn't do. I decided to rent out the farmhouse and move into town, close to the school. After meticulously screening 10,000 people to find the perfect couple to live in the farmhouse, I picked Simone and Dave. They were so excited about living out in the country in such a beautiful setting, that I fell in love with them. As time went on, though, I realized that while Simone was enamored with the idea of country life, (it went with her country decor) the reality of it didn't quite meet her expectations. If you've ever lived in the country, you know that doing this takes a considerable amount of self-reliance. At first you may try to get service people to drive out from town, but eventually you realize it's fruitless and learn how to fix things yourself. Or else you just live with them being broken, a perfectly viable alternative in many cases. Going to the store can take a good part of a day, so you plan ahead, and make sure to bring a complete list. And you don't go very often. Also, there are lots and lots of natural things out in the country that country folks just learn to live with. Like dirt. And insects. Simone and Dave never really warmed up to any of this. For one thing, they were used to having their landlord fix things -- apparently promptly -- so I got called about every little thing that malfunctioned. Which was okay. I understood that I was on the hook for this stuff. I just wished they would learn to do one or two things themselves to save me the many long drives out to the farm. But at least they weren't trashing the place, as I'd tell myself during yet another emergency run down to the farm. "Hi Megan! This is Simone." "Dishwasher's broken. Please come over and fix it right away." "I don't know, it just won't start." "Have you tried some different things to get it working?" "No. You need to come over right now and fix it." "Because the dishes are piled up and need to be washed." "How about hand-washing them for today?" "No! I can't do that. It would break my nails." "OK. I'll be there in an hour." 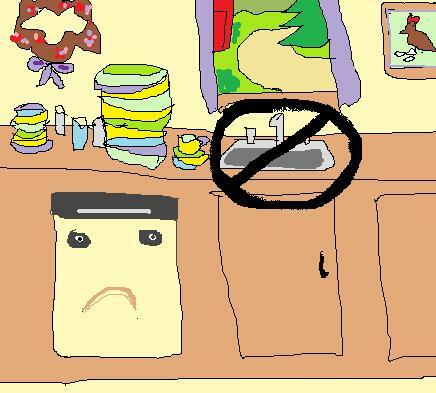 Simone had a strict "No Sinks" policy. One day I left work early, in plenty of time to get to Liz's evening band concert. When I got home, I made the mistake of checking my voice mail. "Megan!! This is Simone! Are you going to get an exterminator?!!!!" Click. Dial tone. "Hi Simone, I got your message. What's up?!" "Okay. That's okay, they do that every fall. They settle down in the corners and sleep through the winter." "They're buzzing me. And they're biting Dave. Get an exterminator RIGHT NOW!!!!!!!!!" "No exterminator! Those ladybugs have a job to do. They eat the aphids. And they need a warm place to stay in the winter." "All right. 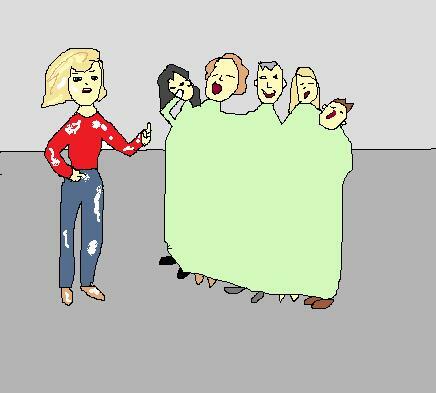 I'll come over and get them out of there for you." I left Liz a note to bum a ride to her band concert, picked up a case of caulk at the hardware store, and headed down to the farm. With tears in my eyes and a heavy heart, I scooped up every ladybug I could find and put them all outdoors. They'd be spending a long cold winter in the barn. Then I caulked every crevice they could possibly sneak back in through. Finally, covered with caulk and feeling a combination of guilt and sadness, I set out for Liz's concert. I was only 30 minutes late, and the auditorium was dark, which was a good thing because my attire and state of grooming weren't exactly perfect. The chorus was still singing, and the band hadn't come on yet, so at least I didn't have to bear the guilt of missing Liz's performance on top of everything else. After the concert I planned to sneak out before anyone actually saw me, realizing that Liz might be mortified by my appearance. But my latest attempt to avoid embarrassing my daughter came to the usual ill-fated end. In this case, heading for the back door, I was corned by some of the band parents wanting to chit chat, which forced me to explain my appearance. My story was met with laughter, and more laughter, and then some more. There was so much laughter, in fact, that I ended up laughing too, even though I wasn't sure why. I thought to myself, "If this story makes people so very happy, then I want to write it down some day, although I'm not certain why those people were so happy about the poor little ladybugs." But laughter is nearly always a good thing, and I try not to question where it comes from too much. I evicted those cute, docile, helpful little ladybugs for good.